A country’s visit would be incomplete without a stroll through its capital. That of Port Louis is even more important because the Mauritian capital is home to the political and economic structures of its history and development. Already known during the Dutch colonial period as Noord-Wester Haven (North West Port in Dutch), it is under the French that the city will really take off. The city plan, checkered, typical of colonial cities, is based on port basins that have been and remain today, the lungs of the city. We will focus for this first part on the sites bordering the port. The origin of the name of Port Louis remains uncertain. Two schools of thought compete on the subject; a penchant for a name given in honor of the then French sovereign, Louis XV, while the other postulates that the site was named in memory of Port Louis, Brittany. Still, it is under Nicolas de Maupin, who in 1729 became the first full-fledged administrator of the island, that Port Louis became the administrative capital and the main port, at the expense of Port Bourbon (Grand Port) . However, it was under the government of Bertrand François Mahe de Labourdonnais, arrived on the island in 1735, that the city was endowed with a well-equipped and well defended roadstead, as well as several buildings including attics, a dry dock , an arsenal, an armory and a hospital. Many of these structures are still present today and can be visited. They took shape in the hands of slaves from Africa and artisans from Madras. Without going into the details of the long and rich history of the city, it is nevertheless useful to remember that Port-Louis knew a great development under the administration of the royal intendant Pierre Poivre (between 1766 and 1772), better known for its introduction of spices and various plant species. Upon his departure, Bernard Marie Boudin, better known as the Chevalier de Tromelin, a naval engineer, undertook to enlarge the port on the side of Trou Fanfaron and Caudan. This expansion enabled Port Louis to become a base for naval operations in India and during the United States War of Independence. 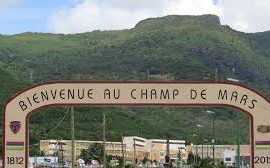 The city underwent a name change with the French Revolution, in 1804 and will be called Port Napoleon, before taking its final name to the British takeover of the island in 1810. Most of the British presence is felt most on the waterfront. Thus, the administrative buildings, including the Government House, date from the Victorian era but we can still see important traces of the French colonization. The Aapravasi Ghat, in Trou Fanfaron where we begin our visit, was built in 1849 in a building built by Mahe La Bourdonnais in 1740. 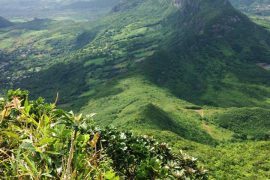 It is the first Mauritian site inscribed on the World Heritage List by the Unesco July 16, 2006. The Aapravasi Ghat, or immigration depot in Hindi, is the place of arrival of Indian immigrants, the ancestors of more than 70% of the Mauritian population. We owe this place of memory to the journalist Beekrumsingh Ramlallah who campaigned tirelessly in the seventies for the site to be recognized by the national authorities. The site was declared a National Monument in 1987 and as such was protected from destruction. The Center, one of the few exhibition sites devoted to the world’s commitment, illuminates what was then called “The Great Experience”, a recruitment system set up by the British colonial government from 1834, to to meet the labor needs of the flourishing agricultural industry and to demonstrate the superiority of free labor over slavery abolished in 1835 in the colonies. This incursion in the past of the island allows to better understand the emergence of the current society in its relation to the Mauritian land but also to the Indian land. A relationship that has remained very strong to this day. Nevertheless, it is important to note that the workers were not only of Indian origin but also from Southeast Asia, China, Comoros, Madagascar, Mozambique and Yemen. It also shows that commitmentism was no better than slavery. Leaving the Aapravasi Ghat, we pass the Grenier, another vestige of French colonization that stands next to the Central Post Office. Warehouse used until the eighties, it has now been converted into a car park but occasionally houses cultural exhibitions. The post office, building with its Doric peristyle, was classified as a historic monument in 1958 . If he lost his primary function, he still remains operational. A large part of the building is now dedicated to the Postal Museum. There are stamp collections of the Universal Postal Union and Mauritius. The museum also traces the history of Mauritian philately and the post office, as well as the delivery by rail since 1877 and the first aeropostal connections since 1933. It also presents collections of postboxes, postal bags, stamps and archive. Mauritius is associated with the history of philately as it was the fifth country in the world to publish stamps, including the famous Blue and Red Penny. Two copies are exhibited in another philatelic museum a little further in Caudan. Before you go there, you can stop in another picturesque place behind La Poste, a former mill with a windmill dating back to the Mahé era of La Bourdonnais. You will discover plans of the eighteenth century mills and the windmill restored by the French company ARAL Nord-Pas de Calais. A museum consisting of various objects, including small basalt grinders, and photos of French mills with wings similar to those of the mill of Port Louis has also been developed. The view of the mill on the harbor is worth the detour. This part of the port is home to tourist-oriented shops just like the Caudan opposite. Between the two, an arm of the sea and an esplanade where cannons make the link between history and modernity. In Caudan, a craft market deserves to be lingered. Less animated than the central market, which we will discover next time, it is nevertheless colorful and has the merit of offering authentic creations of artisans that can be seen at work.